I guess I should have figured that this book wouldn't be the greatest when after reading just the first 3 lines on the first page, I come across an error. haha If Carla is 26, why does she act so stupid when her father is being arrested at the museum? What year is this story suppose to be taken place in?After her father is taken away with the police, why doesn't Carla go with them? Considering she ends up not even knowing where he's taken. A blonde in a turban? Huh....never seen anyone like that.So in Chapter 4 Susie and Cherie leave the prison. Carla and her father leave with the head museum guy, heading back to the museum. BUT!!!!! When everyone went to the prison to get Carla's father out, Carla's friend Doctor Rob had gone with. Yet now he seems to have just disappeared. The author doesn't even mention that he left the prison or anything. How do you manage to not notice that? The email that Cherie sends to Carla was funny. I'm not sure if it's just because I don't really do the whole short hand type messages, but I had a hard time trying to figure out what the message said. haha In the end I got up to about page 100. I just could not go any further. This was such a boring story! I remember one of the last parts I read was when everyone was gathered together eating dinner at the museum, and I honestly had no clue what the conversation was about. It could have been because it was hard to focus on the story, I don't know. Unlike one reviewer I read where they said they had to finish reading the story to find out who the killer was....I didn't. I could have cared less what happened to whoever. Three years ago I read the first book in this series. I loved it - 5 star rating, added a heart, even messaged the author (and received a very sweet reply!) to tell her I liked it. I found it to be a very touching story, less for the mystery, more for the relationship between Carla and her father, who has Alzheimer's. My reading tastes have changed a lot in this past few years, and I doubt I would rate the book so highly if I re-read it now. But I still thought this series might stand above the typical "cozy mystery" genre books.So I am very disappointed to say I truly did not like the sequel. Things get off on the wrong foot with her choppy writing style. I've seen this done effectively, but it was all wrong for the story she's telling. It made it hard to follow the action and characters, and kept me jarred out of the world she was creating. The initial murder is confusing/weird - a man dies near Carla's father in a museum on Egypt (complete with a security guard screaming "Murderer!" at him), but then 'revives' in the hospital and disappears - not that anyone is particularly concerned, just relieved that since the man didn't really die, Carla's father isn't a murderer. Convenient! Then his really-dead-this-time body is discovered, with an ankh in his mouth - blame Carla's father again, since he's one of the professors at an Egyptology exhibit, and those ankhs are mighty rare there. The character responses are too light-hearted for the subject matter - this is a common problem in cozy mysteries - and there are lots of logic flaws. Why would a sheriff insist that an old man who has been diagnosed with Alzheimer's, is obviously confused, and has lived for years in a nursing home is suddenly "faking" Alzheimer's? I can buy that Cherie, the lawyer, got the sheriff fired by digging up some past history on him - but having them turn around and offer her the job? No. (She takes it, ostensibly to move the plot along so Carla can do some amateur investigating with the 'law on her side', but there isn't much mention of it except for calling Cherie and hearing how she put in a "two-man jail" like she was renovating a bathroom.) There's no "solving" of the murder either - Carla lists out the suspects (the characters introduced) and then one of them confesses.I'm not happy to give this a low review, but I am. I was a little disappointed by this book. I had high hopes as I love Ancient Egypt and I have friends who have suffered from parents with Alzheimer's so I had hoped to be able to recommend it.It was a reasonable story, fun twists, some interesting people. The southern lawyer wound me up - I couldn't bear her accent being so overly portrayed and the exact nature of her poorly spelled text messages was just irritating. I did like the relationship between the main character Carola and her Dad who is a renewed Egyptologist now suffering from Alzheimer's. It was described well and with care. The book itself just didn't grab me though. Carla Day and her Egyptologist father Edward Day are visiting the museum where many of his discoveries are kept when a fellow visitor starts choking. Edward tries to save the man, but he is charged with the man's murder by strangulation. Adding to the confusion is that Edward has Alzheimer's. Except that the man isn't dead, just comatose. 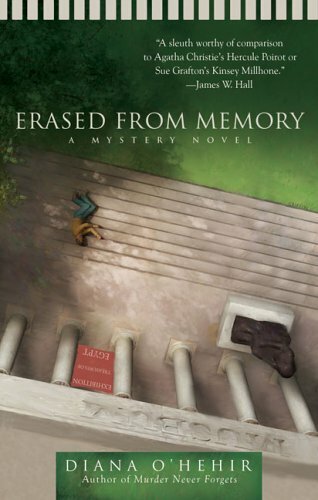 And then he vanishes.Could Edward's faulty memory have the only link between a 1000 yr old death in Egypt and a present day death in California? I liked the premise. Little to close to home at times, my grandfather has alzheimers. He's not the same person that I once knew. Watching someone die by inches in their own mind is one of the most painful things that I have ever done. So reading this book at times, was painful, because I totally knew where this was going!The mystery was so-so plotted, and the subplots of the heroines love life is only distracting, not adding to the story. I'd read it again if nothing else was around. This was one of those books I picked up from a used book sale for a dollar. It is a mystery story about an Egyptologist who is now in his 80's and has Alzheimers and he and his daughter get caught up in murder that happened in a museum that houses one of his finds that defined his career. It was light and quick reading. Dr. Edward Day, professor of anthropology, and Carla are drawn into a murder mystery involving the death of a professor at the museum. The story is interesting and compelling and the resolution is surprising. This book was really hard to get into but once I got through the first 100 pages the rest flew by. I became really interested in the characters after that and NEEDED to know who the bad guy was. Good Read. Interesting style: first person, present tense, staccato style. The use of the main character's father's Alzheimer's disease as part of the plot was unique. It was a good read.